One of my guilty pleasures in photography is to capture images of masterworks from some of my favorite painters. But with a twist. Rather than reproduce the entirety of the painting with my camera, I will find a discrete composition within the painting and then capture it. I also enhance the colors, tweak shadows, add contrast where necessary, and generally give it a richer look. Over hundreds of years, these paintings fade and crack. I love “restoring” them in post processing. 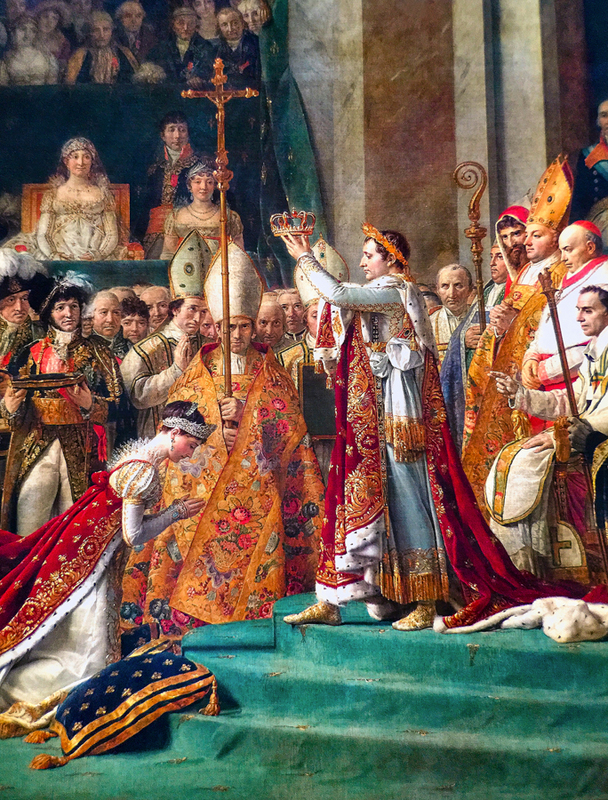 This painting, “Consecration of the Emperor Napoleon I and Coronation of the Empress Josephine in the Cathedral of Notre-Dame de Paris,” was completed in 1808 by Jacques-Louis David, who was the official painter of Napoleon. He was a brilliant painter. This painting, which is located at the Louvre, measures about 32 feet wide by 20 feet tall. It’s a true masterpiece and a sight to behold. Still, within this painting there were several compositions, including the vertical composition you see here. All eyes were on Napoleon and Josephine and I chose to zero in on the two of them. I invite you to check out the entire painting. Do a Google search or visit it in person at the Louvre in Paris. You’ll be able to see what I was thinking with my composition and you’ll see whether I stayed true to the color palette in this oil painting. One of the most difficult parts of capturing this image was the glare from the light in the Louvre. To minimize the glare, I stood on a bench and lifted my iPhone above my head when I captured it. Captured with my iPhone 6+ and a 60mm Moment lens. Note: for private use only. Image not for sale.